It’s an understatement to say the current price of the world’s largest cryptocurrency pales when compared to its past glories – at $6,700, bitcoin is down roughly 60 percent from its all-time high. That said, market conditions aren’t the same as they have been in years past. Indeed, bitcoin’s 2017 boom has brought new attention, and with it, traders and investors who are left wondering if the asset can ever return to its former glory. Certainly, there’s no shortage of ways to approach the question, but one effective method is to look at the charts for historical patterns that could speak to investor psychology, and perhaps, yield valuable hints and clues about future performance. 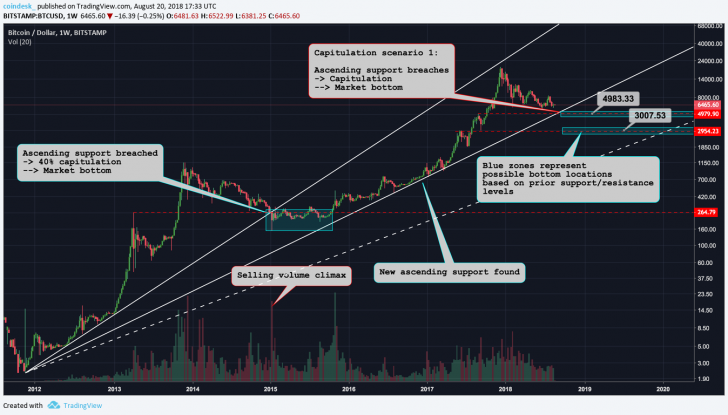 Applying these theories, a market might be expected to “bottom,” or reach a new low, after a speculative bubble bursts in a moment often referred to as “capitulation.” Consisting of extreme selling over a short time period, the infamous 2014 bitcoin bear market finally bottomed out after it lost more than 40 percent of its value in less than three days at the top of 2015. Since such an event could be measured and understood in real-time, some eagle-eyed investors picked up on the move, even drawing attention to it on social media. That’s because, to chart addicts known as technical analysts, all known information about a particular asset is reflected in its price action. So, in order to predict bitcoin’s future, taking a look at its price history is perhaps the best place to start. It’s an inexact science, and there’s no guarantee history will ever repeat. That said, observing the bitcoin’s past price action yields three possibilities worth of being discussed and considered. While technical analysts only take price action into account, it’s impossible to ignore the implications a bitcoin ETF could have on prices of the cryptocurrency. As an indication of the effect an ETF can have on prices of an asset, gold prices increased drastically in the years following the introduction of an ETF. Using this as a measure, it’s valid to assume bitcoin would succumb to a similar and explosive fate. With several ETF proposals awaiting a decision, most importantly the VanEck-SolidX ETF on September 30, a trader must account for any possible outcome. 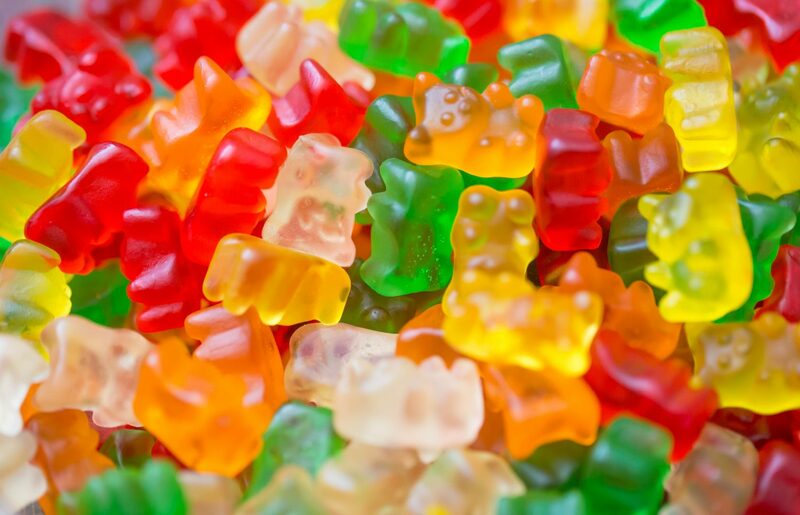 The market is already overwhelmingly bearish, so the true devil’s advocate would play contrarian and account for the ETF’s trend-changing approval. As shown in the above chart, ascending trend lines of support have played an important role throughout the history of bitcoin prices. The first trendline took effect in 2012 when it provided reliable support for a strong uptrend from $2-$16. After surpassing $16, price action went completely parabolic, straying away from trendline until making a return at the end of 2014. This time however, price broke through the support and immediate capitulation took place, selling off more than 40 percent of bitcoin’s price in three days. Since the infamous capitulation and 2015 market bottom, price found a new ascending support (lower white line) that will look to once again come into play sooner than later. The devil’s advocate claims “we’ve seen the worst” of the 2018 bear market, so he is expecting a bounce on or before the fast approaching trendline. The argument has merit, as several bitcoin ETF proposals will be decided upon in the next few weeks and an approval could be just enough to salvage the trend, avoiding large-scale capitulation entirely. If there’s no bitcoin ETF approval, one could argue there’s no reason for bitcoin to resume its bullish uptrend until a market bottom occurs like it did in 2014-2015. Here lies the second bear market ending scenario. Looking at how dramatically price reacted to a breach of its first long-term ascending support in the chart, it’s reasonable to assume it would have a similar reaction if the current trendline breaks (middle white line). If this does occur, there are two locations that present optimal bottoms following substantial capitulation. The first “bottom zone” lies in the $5,000 area since it was the peak resistance level of the prior bull move, from $3,000 to $5,000. Support and resistance lines experience an effect known as “polarity” when they are surpassed. 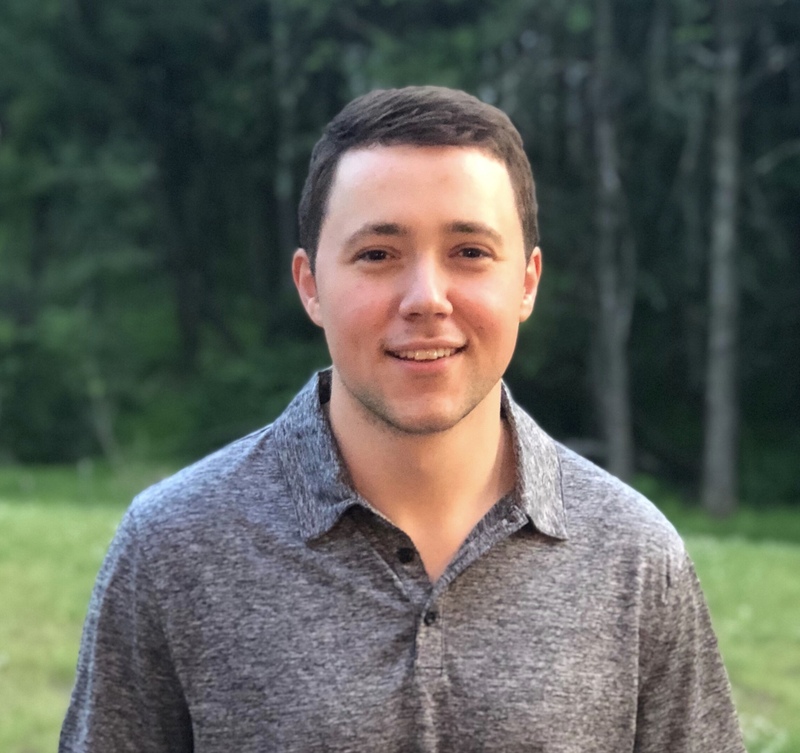 When this occurs, resistance converts into support and vice versa because the party holding up or down prices has finally given up, which shifts control to the opposing party. It’s important to note the $5,000 area has yet to be truly tested as support since it was initially breached as resistance. This suggests a test of the level as support is likely and elects it as a potential candidate for the market bottom. 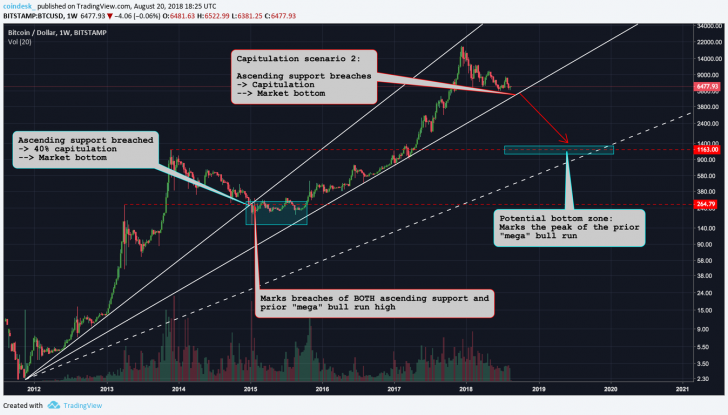 However, capitulation from current levels would not be overly severe for the $5,000 level to hold, perhaps leaving some to believe the market needs more extreme sell-offs in order to find a true bottom. That is where the next potential “bottom zone” of ~$3,000 could come into play. Technically speaking, the $3,000 level is much stronger support than $5,000. Similar to the above zone, $3,000 marked the peak resistance of a prior bull move, except after this resistance broke, the same level was sufficiently tested and proved as support. What’s more, the $3,000 bottom zone would represent an 85 percent deprecation from bitcoin’s all-time high, a near identical peak-to-bottom percent difference as the 2014 bear market of 86.65 percent, according to figures from the Bitstamp exchange. Perhaps here lies another devil’s advocate, the ultra-bearish contrarian. 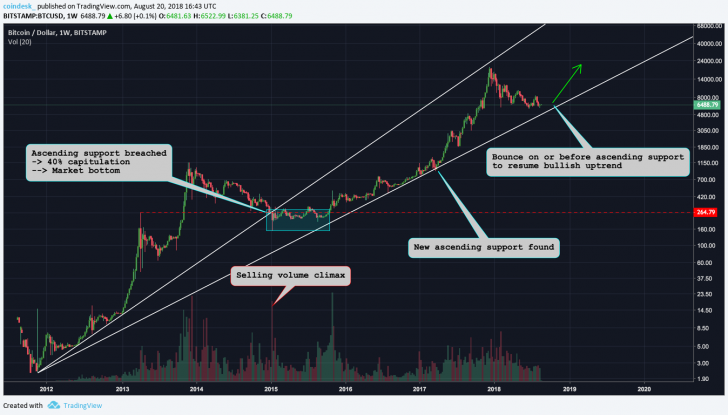 Upon a close examination of the price level (~$240) where the first ascending support trend line was breached in Jan. 2015, it coincidentally also marks the exact peak of the prior “mega” bull run when price surged nearly 1,000 percent from $16 to $240. In a sense, breaking both the trend line and prior bull run high was a “double whammy” to investors giving them no other choice than to lose complete hope, the necessary precursor to capitulation. According to this theory, if the current ascending trend line breaks, price may not find its “bottom” until reaching the high of the prior “mega” bull run, which in this case lies in the $1,200 area. If prices were to fall to this level, it’s last hope would be to eventually find a new ascending support for the entire “bull cycle” to repeat, an estimated outcome depicted by the dashed white line in the chart.